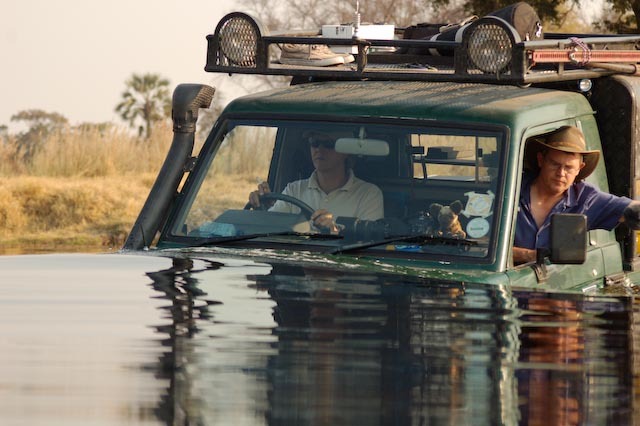 AfriScreen Produced with Mike Holding filming a full one hour episode “OKAVANGO – THE GREAT FLOOD” for the BBC’s flagship natural history series “NATURES GREAT EVENTS”. Also broadcast worldwide by Discovery Channel to over 100 countries around the world. At the peak of the dry season in the Kalahari Desert a herd of elephants look to be on a suicide mission as they head from the woodlands of northern Botswana to the parched sands of the delta – a place that appears to hold little food and water. These resourceful elephants reveal remarkable new behaviour as they try to make the most of the stagnant pools, arid woodlands and waterholes guarded by lion prides. Incredibly, the experienced matriarchs time their arrival at the delta to coincide with the great flood - the annual flooding of Botswana’s Okavango Delta, which turns 4,000 square miles of desert into a maze of lagoons, islands and swamps. Nature’s Great Events follows these resourceful elephants on their journey, revealing new and remarkable behaviour. They film the way they use their trunks to siphon clean water from the surface layers of a stagnant pool, while avoiding stirring up the muddy sediment on the bottom with their feet. Bull hippos also converge on prime territories formed by the rising flood water. They assert their dominance and gain mating rights with the females. The explosive force of these two-tonne giants is captured on film as two big bulls do bloody battle – at times being lifted out of the water by their rival. Lechwe (swamp adapted antelope), zebra, giraffe, crocodiles and numerous fish invade the wetlands. Countless thousands of birds also arrive in the delta, to enjoy the seasonal bounty during this time of abundance. And, in a phenomenon never before filmed in the Okavango, thousands of dragonflies appear – seemingly from nowhere – within minutes of the flood arrival, mating and laying eggs. As the flood finally reaches its peak, elephants and buffalo, near the end of their epic trek across the desert, face the final gauntlet of a hungry pride of lions. Employing a range of high definition filming techniques over two years, in it's production, Nature's Great Events, follows the fortunes of these animals.